The map below provides a quick reference for the threshold concepts themselves and their general groupings, as indicated by Naming What We Know. However, it also shows connections that the reviewers recognize among those threshold concepts, based on general scholarship in rhetoric and composition. While these connections are not all articulated in Naming What We Know, they help to illustrate how composition, as a discipline, mirrors the actual writing process that composition scholars study—nonlinear, recursive, malleable, and never finished. Implicit in Linda Adler-Kassner and Elizabeth Wardle's justification for writing this book was the intention to make visible the architecture of the discipline—not only to establish that there is a complex and worthwhile body of knowledge that should be studied and deemed credible by interdisciplinary and institutional forces, but also to explain, by tracing the inherent connections between certain concepts, how writing is social in nature and how this sociality works to generate knowledge. 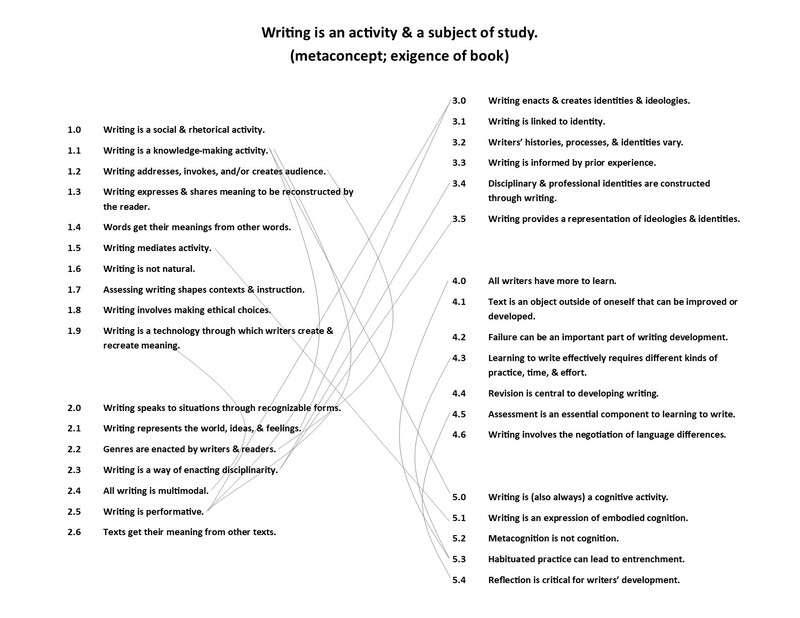 Therefore, Adler-Kassner and Wardle's outlining and naming of the thresholds of writing studies allows other teachers and scholars to interrogate how these thresholds interact with one another and how the acknowledgement and inquiry into one threshold generates curiosity and study into others.